I was trawling the Off-Topic Forum at SPUG when I came across a thread with the the above title. The SPUGgers were talking about a letter of complain printed in the ST Forum Section of the $traits Times. The letter was penned by a certain Ms Devi. An Indian. Why the particular emphasis on "Indian"? Read on as I will elaborate further as we go along. Essentially, the letter griped about the lack of empathy on the part of Singapore Airlines where they were refused boarding as a result of reaching the boarding gate late. 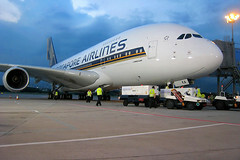 Ms Devi explained that she reached Changi Airport 2 hours before time of boarding, indicating that her party did not reach the airport late. She attempted the sympathy play by mentioning that she was traveling with her mother, kid and more importantly, her ailing father on wheelchair. Read the letter here first before continue to read my entry further. Allocation Of Time For Check-In. Time of the said flight was 8:30am which is one of the busiest periods at the airports. 2-1/2 hours would have been better. 3 hours if your flight is bound for the USA. I have known people who would arrive just an hour (or even half an hour) before departure. If you are doing a quick shuttle i.e. no check-in luggage and had already checked-in online, that is still acceptable but what I don't understand is why cut it so close? Is it so excruciatingly painful that any extra minute spent at the airport will make you want to go kill yourself? Why not just show up earlier? Personally for me, I prefer to arrive at the airport early. 3 hours regardless of destination. Kiasu? More like giving myself ample buffer to handle any unforeseen surprises like needing to go home to get that passport that you left behind (have not happened yet, fortunately). If all go smoothly and I end up with a chunk of slack time, I can still make good use of the extra time to catch up on my reading, sian the XMM ground agents, flight attendants, policewoman or DFS salesgirls, fire up my laptop or use one of the free terminals to catch up on work/emails or go on MSN to sian all the online XMMs. The Toilet. Some of the folks were tracing the timeline of events and came up with something rather interesting. According to Ms Devi, they arrived 2 hours before boarding time and so let's reconstruct the timeline here. 06:00am - Given then time of boarding is 30 minutes before time of departure, I would assume the Ms Devi & Co, arrived at 06:00am. 08:00am - Reached immigration counter after having checked in. My question is how do they account for the 2 hours in between? Surely the check-in process cannot take 2 hours right? Some brought up that perhaps part of the time was taken up by the father who has to go to the toilet and hence to delay. If I interpreted Ms Devi's letter correctly, the toilet episode was after clearing immigration i.e. after 08:00am i.e. the earlier 2 hours were still unaccounted for. Yes, I would like to cut the father some slack as elderlies taking a longer time in the toilet is not uncommon which brings me back to the first point. Arrive at the airport earlier! Dammit! Being Indian. There was a point brought up that perhaps SIA would have handled this matter differently had Ms Devi been a "Lydia Lim" or "Catherine Wong" i.e. non-Indian? It is dangerous to accuse SIA of treating people of a particular race with contempt. Why should a plane-ful of 290 passengers have to be delayed by 4 people who were tardy with their punctuality? I mean if you need a lot of time between checking-in and reaching the boarding gate, arrive at the airport earlier! Dammit! Look, race has got nothing to do with this issue. Had it been Lydia Lim or Yusri bin Jaffar or Chaya Tongchai, it would still be the same. Your luggage comes off and you're are barred from boarding if the gate closes before you unless of course if your last name is Marshall or Anderson or some ang moh name. Ahh.. that one different story liao. In a nutshell, it is my humble opinion that Ms Devi did not have any grounds for complain. She missed the flight as a result of her own bad time management. She also complained about the cold and arrogant attitude of the gate agent but the way I see it, I'd bet she was no angel herself. Earlier I wrote about "Privilege vs Entitlement" where the secret to getting good service is to be a good patron first. Service providers are also human beings with feelings and are no way at any time beneath you. Treat people nice and people will treat you nice too. It's a two-way street. I believed the whole family probably only arrived at the airport at 6.30am (2hrs from flight time) the earliest or even 6.45pm.. Then finished around 7.30am. So that 30mins they happily walked around, instead of going in straight.. Then in the end late.. I also think her agent is not to blame. I think she never informed her father is wheel-bounded. Believe it or not, previously in my ex-company, there was also a complaint to us about the local agent not bringing the customers for the coral island tour in pattaya. After investigation, it was because they were late and then they went off on their own, not waiting for the agent, who arranged a second trip for them. Then still blame us..
Jaschocolate: As far as timing goes, they cleared immigration at 8am which is barely 30 minutes before departure i.e. boarding already started when they were processing immigration. Question is, what were they doing all this while between 6:30am (according to your estimation) and 8am? HiaoAuntie: Well, it is hard to make that conclusion considering the fact that we were there first-hand to witness but I would have very much guess as so. Red Queen: In a way, my traveling pattern is like the lyrics in the song Kokomo where "we get there fast (the gate) and then we take it slow". The way I see it is that when you are traveling, you are going to an unfamiliar place. The less surprises en route the better. frankly, I can't see how anyone can be 'late' to changi airport (I know that wasn't her point but just thought I'd say that). Plus, once you get to changi, how can you be late? Ok, sure, shopping but that's probably the only plausible excuse - seriously. It can't be checking in (American and UK airports are notorious), it can't be getting lost, and frankly, using arguments of a 'racial' and 'disabled' mode - that's really taking the mic really. We were late once whilst trying to get to Slovenia from London - they had closed the check in booth 1/1.5 hours before!!?! we were late due to traffic jam (what usually takes 1.5 hours took us 2.5 hours). They were very nice tho - they rebooked us on the next flight (8 hrs later) and organised for the guys over there to come back and pick us up, and to keep our dinner (well, they made sandwiches instead, which was better)..! result. We ended up missing the 'late afternoon/evening' but hey, we got there in the end! Pam:I cannot see how someone can reach the airport on time and still be late. The only time a person can be late for the flight is when he/she arrived at airport late either like you said, traffic jam or simply the person's own tardiness. In any case, be thankful that the airline staff are making the effort of arranging for you to make the next available flight instead of stomping your foot, raise your abusive voice, bang the table and demand the entire airline and 290 passengers to bend over backwards for your own tardiness.